As the presidential race heats up, President Barack Obama and Republican challenger Mitt Romney are concentrating their focus on one certain house in Washington, D.C. But before they considered the White House as their possible residence, the two lived in a variety of places across the U.S. Here's a roundup of the homes each candidate currently owns. And as a bonus, we threw in the homes of some former presidents. Homes Fit for a President? The former governor of Massachusetts owns a smattering of real estate across the country, including homes in Massachusetts, California and New Hampshire. This collection has been pared down; Romney previously owned two other homes — a large estate in Belmont, Mass., that he sold for $3.5 million in 2009 and a ski home in Park City, Utah, that he also dumped in 2009 for a little over $5.25 million. When Romney is not on the campaign trail, his main home is in San Diego's beachfront community of La Jolla. Romney and his wife, Ann, purchased the $12 million La Jolla home in 2008, telling reporters that he wanted to be somewhere he could “hear the waves.” Apparently a home on the high-priced California coast (median La Jolla home values hit $1,186,200), was the right location. It may be the ideal location, but it isn’t quite the ideal home, at least not yet. In August 2011, Romney filed an application with the city to bulldoze the single-story beachfront home and replace it with a larger, two-story home. The construction won’t begin until after election season, though. In June 2010, the Romneys bought a two-bedroom townhouse in suburban Belmont, shown above. According to property listing information, the Romneys paid $895,000 for the 2,100-square-foot home in the new residential development, The Woodlands. This is the first purchase the Romneys have made in the Massachusetts area in two years; previously they claimed their son’s basement apartment as their legal address. The Romneys own an 11-acre property, pictured above, smack dab on the shores of Lake Winnipesaukee in Wolfeboro. Purchased for $3 million in 1997, the Romneys’ 5,400-square-foot main house and additional guesthouses are home to the extended Romney family each summer. 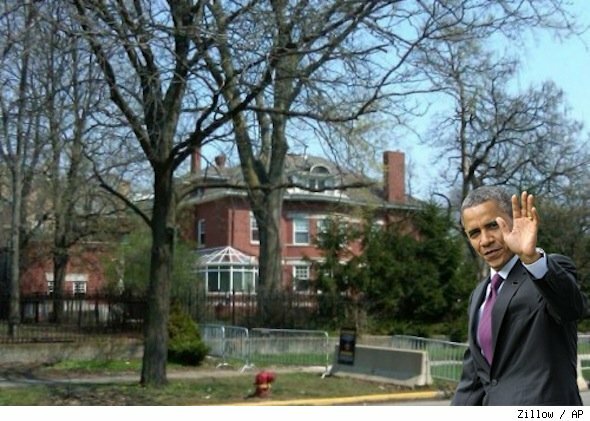 While Obama did spend part of his childhood in Hawaii before moving to Chicago, he owns just one home -- in the Windy City. He and wife Michelle bought the brick home in 2005 for $1.65 million. Located on Greenwood Avenue, the home was built in 1917 and offers 6,199 square feet of space. Although Obama hasn’t owned any other properties, an apartment that he rented while attending Columbia University in the mid-’80s is on the rental market in New York. The two-bed, one-bath Upper West Side apartment has been updated and is available for $2,400 a month. When it came time for former President George W. Bush to retire from the Oval Office, the 43rd president decided to go back to his home state of Texas, picking up a sprawling 8,000-square-foot home at 10141 Daria Place, which was a downsize from the 55,000-square-foot White House. The Bushes also purchased the property next door but tore it down in 2008. People speculated at the time that the demolition was to expand the former first family’s yard. Unlike many other presidents, Bill Clinton didn’t own a home during his residency at the White House. Born and raised in Arkansas, the former president and his wife, Secretary of State Hillary Clinton, chose to stay on the East Coast and purchased a home in Chappaqua, N.Y. at the end of his second term in office. By several accounts, the Clintons are quite popular in the small Westchester County town. Built in 1889, the Clintons’ home is situated on a cul-de-sac lot and has 5,232 square feet of living space, five beds and four baths. Before Ronald Reagan lived at the White House, he lived among the star-studded hills of Pacific Palisades and Bel Air. His former Pacific Palisades property was home base for Reagan and his wife, Nancy, until Reagan was elected president in 1981. After two terms as the 40th president of the U.S., “The Gipper” and his wife returned to Los Angeles, picking up a prime slice of real estate in the posh Bel Air neighborhood. The property remains Nancy Reagan’s home today. Not one, but two of former President Gerald Ford’s homes are currently for sale — one listed in California and one in Colorado. Ford’s Vail home, pictured above, is a testament to his love of skiing and the outdoors. Listed for $9.85 million, the ski-in/ski-out home has been on and off the market starting in 2008, with a hefty price tag of $14.9 million. Gerald Ford’s other home is listed on the Rancho Mirage real estate market for significantly less. The $1.699 million listing is a midcentury ranch-style desert home located on the Thunderbird Country golf course and contains some presidential memorabilia, including a large portrait of Betty Ford hanging in the living room. One of America’s most famous families holds one of America’s most storied properties. The Kennedy Compound consists of 6 acres of waterfront property on Nantucket Sound in Hyannis Port, Mass., a small village in the town of Barnstable. John F. Kennedy’s father, Joseph P. Kennedy, rented a summer cottage in Hyannis Port in 1926 and purchased the cottage two years later. The home, which Joseph Kennedy enlarged and remodeled, became a summer getaway for his family, who enjoyed sailing on the sound. In 1956, after his marriage to Jacqueline Bouvier, JFK bought a smaller home nearby, and his brother Robert later purchased an adjacent home. Following the recent death of another sibling, Massachusetts Sen. Ted Kennedy, the compound was donated to the Edward M. Kennedy Institute. While we don’t have the first president’s childhood home -- the one where he purportedly chopped down a cherry tree -- we do have a home where George Washington reportedly slept. It is believed that the general hung up his wig at this 1739 homestead, named the “Fowler House.” The number of nights that Washington slept here is up for debate, but if you believe the historic marker on the home, he often stayed here on his way from West Point to Connecticut. The New York home is 5,800 square feet and has five bedrooms and two baths and was recently listed on the Brewster real estate market for $500,000.